Thanks to the entire ABD crew for another great Sunrise Park event on and around the original Heckle Hill. Links to all results are here. We know there were a few results errors the last 2 weeks and will have them 100% corrected later this week. Next up, the CCC heads just a bit farther West to Campton Cross. Please make sure you set your GPS coordinate to the correct park. This is our annual Halloween race, so bring your costume A Game and get your cameras ready. There might even be trick-or-treating at the team tents if people bring enough candy. Look for the regular update on Thursday at the regular time. Just a remind to everyone, especially the younger ladies to keep hair up in pony tails while racing. If One2Go and the USAC officials can’t see your bib number, we can’t score you. Thanks! If anyone is available to help out with Kiddie Cross the next two weekends, please email us ASAP. Thanks! While its not officially part of the official CCC series schedule officially, on Saturday 11/3/18 PSIMET will be hosting their “Pre-Deja-Vu-All-Over-Again 2019 State Championship Course Preview Race” at Emrickson Park in Woodstock, IL. This is NOT a preview for this year’s CX State Championships which will be held at Montrose Harbor in Chicago on 12/2/18. With a race name that long, we’re not sure how anyone could confuse the two, but we just want to make sure. 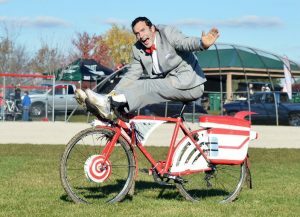 However, NEXT YEAR PSIMET will be hosting the CX State Champs in Woodstock, hence the preview this year. If you still aren’t sure what’s going on take a look at our schedule page, email us, or ask Kenny on Sunday. Sponsorship opportunities for the 2018 Illinois State Cyclocross Championship and series finale are available! Spidermonkey Cycling, with Ten27 Cycling Club, are seeking additional sponsors to help alleviate the cost increases associated with having the event at the legendary Montrose Beach location in the city of Chicago. Event title sponsorship with multiple branding opportunities and expo locations to activate your business are both available. For more information, email Mark Zalewski. And finally… Here’s our annual reminder that, if you are warming up on course you should never, ever, ever, evar ride in front of someone who is still racing. We know it can be difficult to tell sometimes with large fields and riders spread out all over the course. However, it is your responsibility while pre-riding to figure it out, NOT the person still racing to tell you they are still racing. Full stop. Let’s make sure everyone gets their fair and full time to race. If you need more time to pre-ride, please arrive at the race venue earlier, bring a trainer, or eat more doughnuts. Thanks in advance!